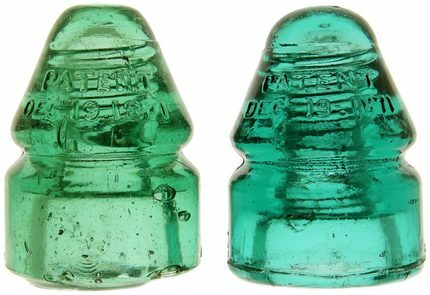 Lot 48: CD 132 PATENT DEC. 19, 1871 Color: Limey Green and Aqua Description: (Left) Typical crude base with factory flaws and 3/4" and 1/2" open base bubbles, otherwise very, very near mint. Some milk wisps throughout the glass add character (Right) 1/4" bruise at the base of the threads and on the left mold line. Strong bold embossing on both of these early telegraph insulators by Hemingray. Nice color contrast for this pair of old "Bullets!"